It’s hard to get ahold of Trooper Jake Abbott during the summer. He’s just back from a two-week boat patrol between Juneau and Ketchikan. When he did pick up the phone, he said his investigation report on the seven-man hunting spree was nearly 20 pages. Abbott said they’re generally closer to two. It took more than a year but in May, wildlife troopers based in Juneau finally charged seven men with Juneau ties who they suspected for a slew of hunting crimes and one fishing crime. Abusive hunters undermine management of the state’s wildlife resources, Abbott said, and that investigating and prosecuting more complex cases sends a message that it’s not OK. In February last year, the wildlife troopers heard a tip that during the 2015 deer hunting season, a group of friends took hunting trips south of Juneau into Stephens Passage near Admiralty Island and to the west into Cross Sound near Elfin Cove. The source said they killed a lot of deer and broke a lot of laws in the process. These aren’t people crimes. But, Abbott said they’re important because they hurt the state’s efforts to protect its living resources, and the rules give hunters and fishermen a level playing field. The troopers looked for digital media evidence: text messages and ritual, post-hunt pictures. They looked for leftover animal carcasses and antlers, and they held a lot of interviews. The more they learned, the bigger the case got, Abbott said. He compared it to a tree. “You start at the roots and then as the case grows, it starts branching out and all these other violations for other things start getting found,” Abbott said. One big problem was the group shot deer from a boat, Abbott said, which is easier than tracking an animal on land. It’s also illegal, except for hunters with special permits for disabilities. The deer might run into the woods, die out of sight, and the meat is wasted. Abbott said you’re also not giving the animal a fair chance. Many times, he said the deer doesn’t realize it’s in danger. He said other hunters who follow the rules don’t have a lot of love for people who do this. Some of the hunters also abused the proxy hunting system, Abbott said. Proxy hunters can stand in for elderly or disabled Alaskans. Both people have to be residents. In this case, Abbott said a resident who was proxy hunting wanted to help his nonresident friend kill more deer without paying for them. Abbott said when the nonresident killed deer, the friends reported they were harvested by proxy. Nonresidents can take four deer in the areas the group hunted. They have to buy small wire tags to fix on each deer they kill. In 2015, Abbott said nonresident deer tags cost $150 each. “You’d be looking at $600 in addition to your nonresident hunting license that you’d have to purchase,” Abbott said. If every hunter avoided paying for those tags, Abbott believes there would be a ripple effect. “Number one, we’re not getting accurate harvest data back to Fish and Game on who harvested what, where and when,” Abbott said. Abbott said the second problem is the Department of Fish and Game gets federal matching dollars from selling tags and hunting licenses under the Pittman-Robertson Act. “What that act does is for every license, tag and other items that are purchased … that purchase gets multiplied by three and the Department of Fish and Game receives those funds for management of the resource,” Abbott said. 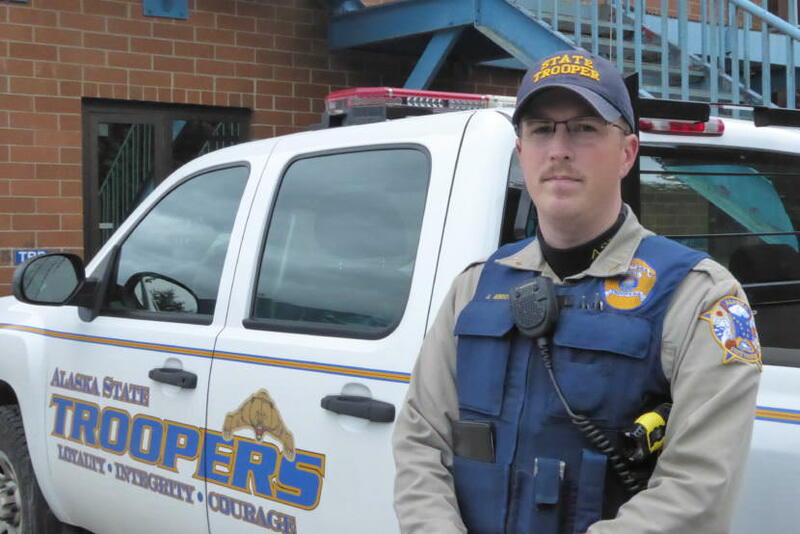 Troopers also charged individuals in the hunting party with unlawful possession of game, making false hunting reports, taking too many deer and illegally catching a halibut. It’s unclear how many deer the group killed. Abbott said most of the offenses are misdemeanors. Benjamin Olson, Mckenzie Wilson and Wyatt Weimer, all of Juneau, pleaded no contest. They have to pay fines and restitution ranging from $650 to more than $1,000. Grantley Moore, Tyler Mathews and Anies Sadeghi, all from Juneau, pleaded not guilty. Their trials are scheduled for Sept. 19. Moore’s lawyer decided not to comment. Sadeghi could not be reached for comment. Tyler Mathews’ lawyer, Nicholas Polasky, said he would not comment because the wildlife troopers had not turned over any reports or information about their investigation. Daniel Collins of Oklahoma didn’t make his court appearance and the court issued a $500 warrant for his arrest. Abbott said members of this group may also temporarily lose their hunting privileges.